An overview of eczema symptoms, causes, and treatments. Plus: how to prevent eczema from striking in the first place. “Eczema” does not refer to a single health condition. It’s an umbrella term for a number of closely related skin diseases, all of which cause a cluster of skin issues. Up to 30 percent of the United States population has some form of eczema, and its typical symptoms include red, itchy, swollen patches of skin on the hands, cheeks, feet, or on the insides of the knees or elbows. Regardless of its underlying cause, eczema isn’t contagious, and its symptoms tend to come and go. While a handful of health conditions cause eczema, the most common trigger is atopic dermatitis—a chronic inflammatory disease that tends to show up during childhood (and usually before age 2). Many people use the terms “eczema” and “atopic dermatitis” interchangeably. But in the same way that not all headaches are migraines, not all eczema cases are atopic dermatitis. Allergies, stress, and contact with substances—including water or chemicals—can trigger eczema flare-ups even in those without atopic dermatitis. 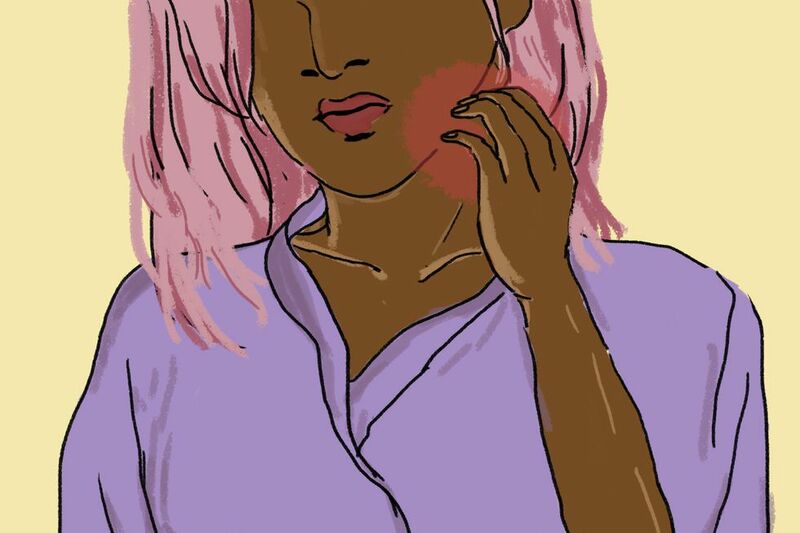 Eczema is slightly more common among women than men, and African Americans tend to experience higher rates of eczema than other populations. Eczema has grown more common during the past two decades, though experts aren’t sure exactly why that’s happening. Psoriasis vs. eczema: What’s the difference? Their looks: Both psoriasis and eczema cause patches of red skin, but psoriasis plaques are also scaly and raised. The parts of the body they strike: Eczema typically occurs on parts of the body that bend, such as the inner elbows and behind the knees. Psoriasis, on the other hand, is most likely to strike on the elbows, knees, scalp, palms of hands, and soles of feet. Their causes: Psoriasis is an autoimmune condition, while eczema is triggered by external allergens and irritants. (Learn more about what causes psoriasis. While all forms of eczema are associated with skin symptoms, there are several different types of eczema. These types are defined by their presentation (how and where they show up) and by their underlying causes or triggers. The most common type of eczema, atopic dermatitis is an inflammatory skin disease related to improper immune system activity and problems with the skin’s outermost layers. Inflammation promotes a breakdown in the skin’s protective barriers, which leads to dryness and other symptoms. Atopic dermatitis tends to show up during childhood, and often presents as red, itchy rashes on a person’s cheeks, or on the insides of her knees or elbows. While the condition may subside before adulthood, it can stick around throughout a person’s lifetime. Between 7 and 10 percent of adults have atopic dermatitis. This type of eczema shows up as small fluid-filled blisters on the palms or soles of the feet. These blisters can itch and burn, and may leak clear fluid. The causes of dyshidrotic eczema aren’t known, but it often shows up in patients with atopic dermatitis or allergies. While its underlying causes aren’t known, this form of eczema is caused by chronic rubbing or scratching. That irritation causes the skin to thicken, and can lead to the formation of scaly red patches on the head, lower legs, wrists, or arms. This form of eczema may be related to a type of yeast irritant in the oils of the skin that causes an immune system reaction. It tends to show up as dandruff, or flaky red patches of skin on the scalp or face. This type usually shows up as thick, red, inflamed and itchy skin on the shins or legs. It’s often caused by blood-flow problems, and it may show up more commonly in people with varicose veins. In many cases, the exact causes or triggers of eczema aren’t well understood. But eczema sometimes results from a specific gene mutation that causes a lack of protective proteins in the outer layer of a person’s skin. This genetic component helps explain why eczema runs in families. Environmental factors, especially early in life, also seem to play a part. It’s possible that kids with underlying genetic vulnerabilities develop eczema if they’re exposed at a young age to specific allergens, irritants or chemicals. Research has shown that breastfed babies are less likely to develop eczema, while a fast-food diet or lots of time spent indoors seem to increase a child’s risk. Experts are still teasing apart how all these factors may contribute to a person’s risks for eczema. Eczema symptoms can appear anywhere on the skin—from the scalp to the bottom of the feet. But the symptoms below usually show up on an adult’s hands, the insides of the elbows or knees, and the back of the neck. In infants and kids, all those same hot spots are still a problem, though eczema often also shows up in a child’s cheeks, arms, legs, and torso. There are no lab tests for eczema. Dermatologists and physicians diagnose the condition based on a physical exam and a discussion with the patient about his symptoms. If a patient comes in with red, scaling skin on his face and scalp, a doctor may determine after close inspection that the patient has seborrheic dermatitis. Or, if the patient is an infant or toddler with rashes on her cheeks, arms and legs, a doctor may diagnose her with atopic dermatitis. A doctor may also ask a patient if she has been stressed, if she has any known allergies, if she’s taking any medications, or if she’s been exposed to any metals or chemicals. Each of these factors could help a doctor determine if eczema (or something else) is to blame for a patient’s skin issues. A doctor may also ask how long symptoms have been occurring, whether those symptoms ebb and flow, and what (if anything) seems to make them worse or better. If a doctor believes a patient’s eczema is being triggered by an allergy, she may order skin-prick tests to confirm that an allergy is indeed part of the problem. But that has less to do with diagnosing eczema than in identifying its potential triggers. (A patient can be diagnosed with eczema even if its cause is never identified. The best eczema treatment for you depends on symptoms and how severe they are. That said, several remedies are commonplace, including over the counter ointments, sprays, and lotions, prescription creams, doctor-administered drugs, phototherapy, relaxation therapy, and biofeedback. A doctor may prescribe a topical anti-inflammatory cream or gel—often a steroid like cortisone, in either prescription or OTC strength—to reduce redness, swelling, itching and irritation. Once a flare-up has settled down, eczema patients are instructed to moisturize regularly—multiple times a day, if possible—in order to keep their skin’s protective barrier intact and to avoid another flare-up. In many cases, over-the-counter moisturizing products are fine, although doctors typically recommend products without heavy fragrance or tint. (Look for products containing words like “sensitive skin” or “hypoallergenic.”) Moisturizes that contain ceramides—one of the natural fats found in the skin—often work well for eczema patients. While topical treatments are sufficient for some patients, others may need next-level medications. These could include an injectable drug called dupilumab, which helps switch off some immune system signaling pathways that promote eczema. Topical immunomodulators (TIMS) are another class of drug that can help calm down the skin’s immune activity and have been shown to help some eczema patients. Exposure to UV light rays can help suppress some overactive immune cells in the skin, and so can prevent flare-ups. For some patients, anxiety or mindless skin-scratching can fuel eczema. Counseling or therapy can help these patients manage their stress and unhelpful personal habits, which can prevent new symptom break-outs. The most common and crippling complication of eczema may be the social embarrassment and insecurity that can accompany symptoms. Especially for adolescents and young adults, living with eczema can be mortifying. Sleep disruption or insomnia. Eczema’s symptoms can be uncomfortable or even painful, and so can promote poor-quality sleep or a lack of sleep. Depression. Research has shown that eczema patients—especially teens and young adults—are at greater risk for depression than those who don’t have the condition. This uptick in depression risk may stem from the social anxiety these patients feel as a result of their skin symptoms. Scarring. Over time, scarring or skin discoloration can result from eczema break-outs and the scratching they entail. Allergies. Eczema patients are at much greater risk for allergies and asthma than individuals without eczema. There is no cure for eczema, and there are no well-established ways for a person to protect herself from developing the condition in the first place. But there’s good news: when it comes to preventing eczema from flaring, there are several well-established safeguards, and all they require are some relatively simple lifestyle changes. Long, hot showers or baths irritate and draw water from the skin, and so promote flare-ups. Gently patting the skin dry after bathing (as opposed to wiping it harshly) can also help. As skin dries, moisture is naturally wicked away. To prevent over-drying, always moisturize after bathing, swimming, or getting skin wet. Fragrance-free soaps made for people with sensitive skin can help prevent dry skin and eczema flares. Wearing gloves to do dishes or chores can keep the skin away from contact with harsh chemicals, soaps, or other irritants that can trigger a symptom outbreak. Washing clothing in detergents designed for people with sensitive skin is also a good idea. Staying well-hydrated can help prevent dry skin. Aim for eight glasses a day. New duds often come coated with chemicals that can irritate the skin. Wash them before wearing. Loose cotton clothing is also less likely to irritate skin than tight, synthetic garments. Stress is a known eczema trigger. Meditation, yoga, and exercise are all proven stress-fighters. Counseling can also help individuals develop effective stress-reduction techniques.